Striding out to knock off that triple. If the price of dreaming big, cricket wise, is all those bank ads, it’s one I’m prepared to pay. 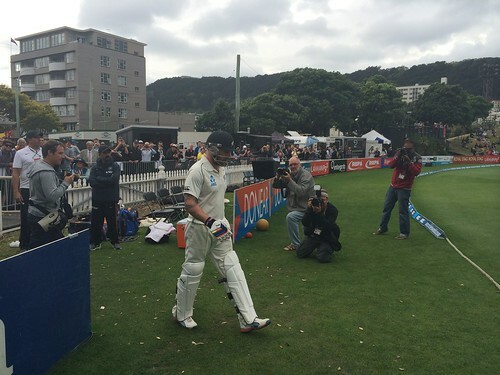 We’ve been very spoiled under Brendon McCullum. Up the rankings, actual depth, some stunning individual and team performances and the elimination of those games where we just never showed up. The skipper never bogged himself down in boring old survival or arse protection. He took on the job with many ups and downs as a professional cricketer under his belt and with his head up and eyes open and a clear idea of how we should play – positive, attacking and prepared to have a punt. He’s one of cricket’s elder statesmen now – when he talks, people listen whether it’s about the state of those Kookaburra balls or the upcoming spirit of cricket speech. He held the world’s press in the palm of his hand before the world cup final, going over his team’s story and how they planned to play, while his opposite number squeaked out his plans to retire in the equivalent time slot. The tour of England that followed was like Captain Cook in reverse, with the colony bringing heady abandon to the motherland, producing that bonkers series, the high point of the throw-everything-at-it, attack from everywhere approach. Showtime the day before the final. I loved watching him in the nets, those cuts and smashes back past the bowler would make either a fearful sonic boom or a thick, woody click that meant he’d really, really found the middle. There were days he’d face a ridiculous number of balls, leaning on the bat and having chats with his players in between. On other days it was like BYC, with all the trick shots and banter with the bowlers, to help get his team in the positive mindset he wanted. Yer average park cricketer could never imagine playing an elegant billiard ball drive like Fleming, but everyone can relate to giving it a go like Brendon – swinging hard, dancing down the wicket or playing beach cricket scoops. He just happened to do it against the world’s best and fastest. While we’re all a bit flat after the Australian series, we still have a young, skillful team with more depth than we know what to do with. The coach, manager and support staff are all still there and we’re about to have the very-recent world’s number one batsman take over as skipper. We could be much worse off. It will be interesting to see where Brendon pops up next, I hope he finds time to give the battered body he was always so happy to fling at an advertising hoarding a rest for a while. I’d love to hear his thoughts from a commentary booth every now and again but I’m not sure that’s his style. No doubt whatever he does, he’ll do it his own way and be pretty comfortable with it. A proud moment let down by poor footwear selection. All very good stuff and agreed. I’d like to make one mention of a very poignant moment in his career – picking the right moment to hang up the gloves without which most of the above events may never have existed. I moaned about the decision to stay on as a batsman and until he was handed the captaincy I felt vindicated, then the world exploded!! And I saw the smoke.